Casino Gambling's #1 best-selling author Frank Scoblete is back with a new twist on learning to beat the house at the blackjack table. 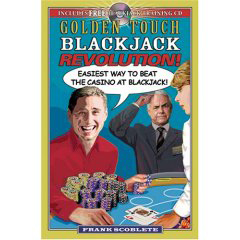 Golden Touch Blackjack Revolution explains Speed Count, the easiest advantage-play method for blackjack ever invented! If you have tried counting cards and found it too difficult or labor-intensive, or if you are a basic strategy player looking to the edge this book is for you! It also includes a free blackjack training CD.